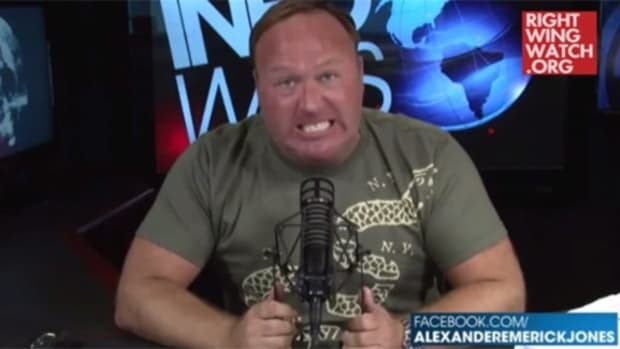 His audience believes the government is intentionally creating more gay people by poisoning juice boxes, and they'll absolutely believe that news media and the U.S. government are working together to discredit Alex Jones. 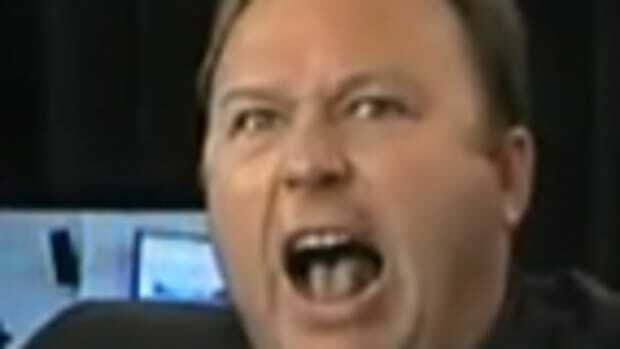 As predicted, radio conspiracy theorist Alex Jones is milking the hell out of his missed Sunday show appearance on This Week with Martha Raddatz. 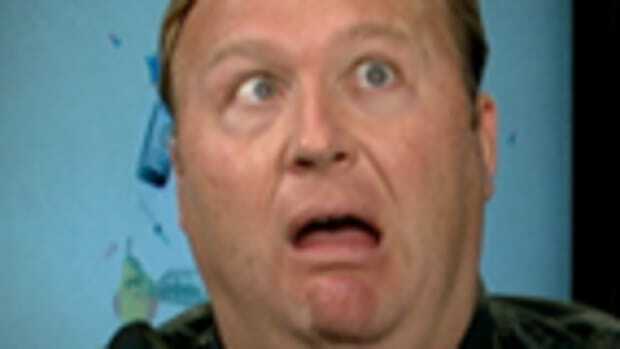 Jones was apparently scheduled to be a guest on the show to discuss his cockamamie Jade Helm conspiracy theory in which the U.S. military is somehow planning to seize all of Texas and declare martial law. In the real world, Jade Helm is nothing more than a routine military training exercise. But don&apos;t try to tell Alex Jones and his legion of paranoiacs -- they&apos;ll tell you they have the documents proving Jones&apos; ludicrous theory. 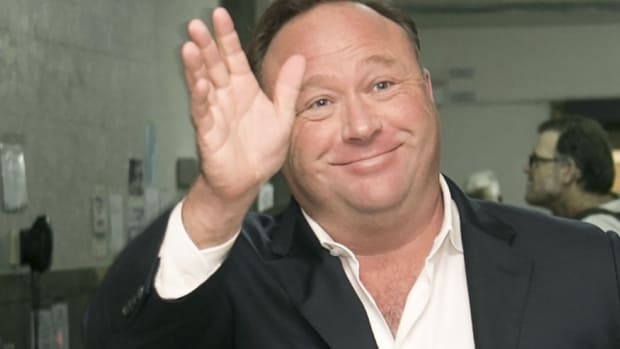 Instead of simply admitting there was a miscommunication about his This Week appearance or that he had second thoughts about doing the show, Jones has decided to manufacture a conspiracy meta-theory in which ABC News is perpetrating a "hoax" (his word), saying that Jones&apos; was "scared" to be on the show when in fact they deliberately tried to embarrass and discredit him. 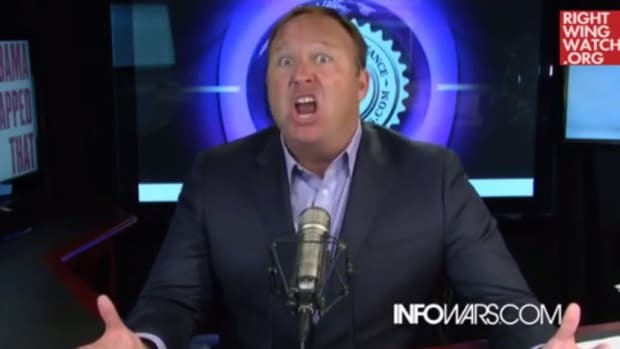 Monday on his show, Jones ramped up the conspiracy-inside-a-conspiracy by lying to his audience, and actually self-debunking one of those lies. I haven&apos;t aired all of ABC&apos;s This Week where they ran this whole hoax that I didn&apos;t show up when I said I&apos;d come on &apos;cause I was scared. No one from ABC News said Jones missed the show because he was "scared." No one. It never happened. No wonder Jones didn&apos;t air the segment on his show because neither Raddatz nor her guests said anything about Jones being scared to appear. Don&apos;t set up an interview with Alex Jones and say you did. He appears to be suggesting they never set up the interview in the first place even though his own InfoWars website posted texts and emails proving that the interview was planned in advance. Don&apos;t you think they&apos;d put me on all these shows? No they&apos;re afraid. Because I run over them. Dominate. It becomes a huge news issue, their show gets high ratings for a whole week. They don&apos;t want that. Television shows don&apos;t want high ratings for a whole week? Clear evidence that Jones is living in a self-imagineered fantasy mirror-mirror universe in which lizard people exist and where television shows hate high ratings. It&apos;s so scary to sit in a chair with a camera aimed at you like I&apos;m doing right now and quote Eisenhower about the military-industrial complex, and to talk about and hold up news articles -- I was looking forward to it. Okay, so how was he looking forward to an interview that was never set up? 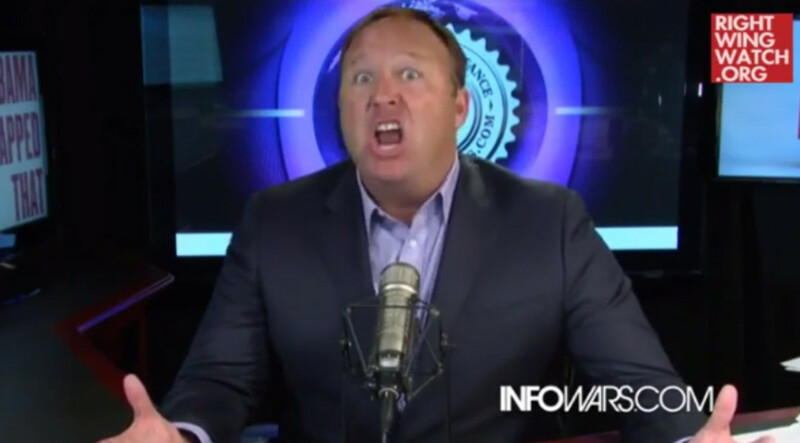 In the InfoWars write-up about the fracas on Sunday, Jones said he didn&apos;t even know the interview was locked. By the way, those "news articles" he always holds up? They&apos;re always print-outs of hocus-pocus conspiracy theory blog entries from his own website. Evidently one of Jones&apos; listeners agreed that Jones was afraid to appear on the show. A caller named "Aaron" managed to get on the air and made chicken noises, then went on to say that Jones didn&apos;t want to go on the show because he always blows up and makes himself look foolish. Regardless of Jones contradictory statements on the matter, he wasn&apos;t scared at all -- he was being theatrical. 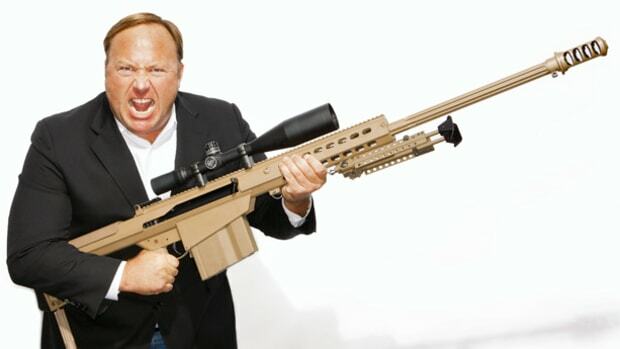 His audience believes the government is intentionally creating more gay people by poisoning juice boxes, and they&apos;ll absolutely believe that news media and the U.S. government are working together to discredit Alex Jones.